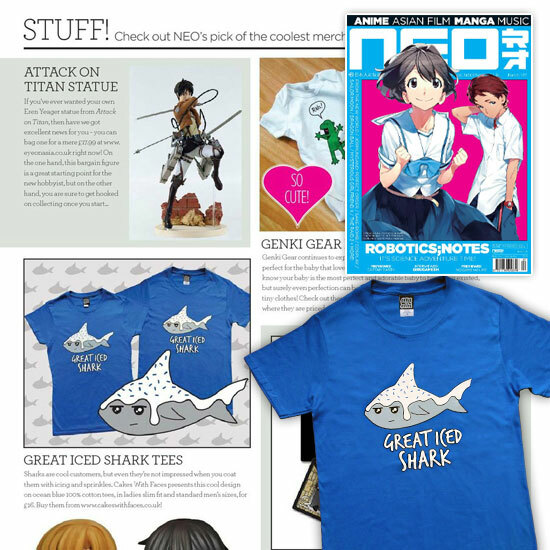 Our Great Iced Shark t-shirt, featured on the Stuff page of NEO magazine, the UK anime and manga magazine. Find us on the Stuff page in issue 127 – a collection of the coolest merchandise of the month. NEO magazine’s available from WH Smiths, Sainsbury’s and online (print and digital editions) from the NEO website. You can get our Great Iced Shark t-shirt from our online shop, in standard/mens and ladies slim fit sizes.